Part 1 of the report was centred upon the activities of Lib.Dem MP’s and David Mundell in Scotland actively undermining the Scottish government at Holyrood in the period 2013-2014, up to the time of the referendum. After the referendum, armed with a “No” vote majority and backed by the resources of the state at Westminster the persons concerned, (aggressively led by Mundell) saw no reason to continue with a low key approach developing their plans for the islands. The gloves were removed and any disguise of their activities was abandoned in the knowledge that the Westminster government had taken charge of the agenda to the complete exclusion of the Scottish government. The Leaders of Scotland’s three Islands Councils have welcomed the findings of the Smith Commission as a major landmark for the “Our Islands Our Future” campaign. The Commission was set up following the Referendum. Its recommendations will form the basis of legislation on more powers for Scotland and the 3 Isles. Through “Our Islands Our Future”, the councils in Orkney, Shetland and the Western Isles are working together to achieve a further devolution of powers to the islands they represent. Their shared aim is greater control over decisions that affect island communities – and an enhanced ability to develop their local economies for the benefit of the people the Councils serve. The campaign made a joint submission to the Smith Commission. In his report published today, Lord Smith says: “There is a strong desire to see the principle of devolution extended further, with the transfer of powers from Holyrood to local communities. Orkney Islands Council Convener Steven Heddle said: “This is a major achievement for the campaign, with the island authorities the only councils referenced by name in Lord Smith’s report. Devolution of the Crown Estate’s assets will give us the ability to ensure development in our waters is sustainable and delivers the maximum benefits for our communities. This has been a good week for “Our Islands Our Future.” Today’s announcement follows the appointment of Scotland’s first Minister for the Islands – another of our aspirations. Derek Mackay’s brief also includes transport and he has already demonstrated his willingness to discuss matters such as the future of our internal ferry service, reiterating that the cost of replacing vessels should not rest solely on the island authority. Our joint campaign is clearly making a difference for the three island communities, and adds value to the extensive lobbying we carry out individually. Angus Campbell, Leader of Comhairle nan Eilean Siar, said: “The recommendations on the Crown Estate are historic and very welcome indeed. The Comhairle has long made the case that Crown Estate revenues should be retained in Scotland and that local communities should be the beneficiaries of income derived from sea-bed and foreshore developments. Indeed, this was a key aim of the OIOF campaign and was recognised by the Scottish Government in the Prospectus, Empowering Scotland’s Island Communities, which set out an agreed way forward for Island authorities and the Scottish Government. The Commission’s recommendations are a fundamental shift in the democratic structure of modern Scotland and recognise the wish for the further transfer of powers to local levels. Gary Robinson, Leader of Shetland Islands Council, said: “The publication of Lord Smith’s report is an important milestone in the OIOF campaign and we expect it to deliver tangible benefits for our island communities. For example, the proposal to devolve powers over Air Passenger Duty to the Scottish Parliament is to be welcomed. The Scottish Government has made no secret of its wish to abolish this tax, which will obviously benefit our lifeline air transport services. Further control by the Scottish Parliament over home energy efficiency schemes will reduce the scale of fuel poverty in our islands. The three Island Councils of Orkney, Shetland and the Western Isles are seeking early meetings with the new Secretary of State for Scotland and other key players to discuss (OIOF) and specifically to seek reassurances on the commitments of the previous Government on the campaign for more powers for Island areas. Although the previous agreements took place with a Conservative/Liberal Democrat coalition government, the 3 Councils expect commitments to be honoured by the new Conservative Government. Leader of Comhairle nan Eilean Siar, Angus Campbell, said: “We welcome the appointment of David Mundell as Secretary of State for Scotland, having worked productively with him in the past, and look forward to doing so in the future. We did the groundwork previously with the UK Government and although there has been a change in Government we would expect them to continue along similar lines with regard to Our Islands Our Future. It is good to hear the Prime Minister say that the Smith Commission recommendations, arising from the ‘Vow’, will be honoured in full. From the Islands point of view that is important as one of the key recommendations is the transfer of revenues and management of the Crown Estate to the Scottish Government and, as agreed by Scottish Government, onwards to local coastal communities, one of the key aims of the OIOF campaign. Hopefully there may be additional powers for Scotland as argued for by the islands Councils in their submission to the Smith Commission”. Orkney Islands Council Convener, Steven Heddle, added: “We’re keen to quickly build on the progress made with the last UK government in terms of ensuring the islands have a voice and have our perspectives considered and accounted for as matter of course. This is across a whole range of reserved issues, but notably with respect to our ambitions for the ultimate transfer of the powers and revenues of the Crown Estate to the islands councils, as recommended by the Smith Commission following our representations. The new government has undertaken to implement the Smith recommendations in full and we are clearly keen to see this happen. Confirming, (ahead of a visit to Stornoway) the British Government’s on-going commitment to working with the OIOF campaign Mundell is to attend an upcoming “Islands Working Group” meeting with each of the islands leaders and those closely involved in the campaign taking forward commitments detailed in the Islands Framework. He also confirmed the British Government’s on-going commitment to a major decentralisation in decision making across Scotland. He said: “I’m looking forward to visiting Stornoway to confirm my on-going commitment to the Islands framework, placing power in the hands of communities making sure opportunity and prosperity reach every part of the United Kingdom. It also shows how the Western Isles coming together with Orkney and Shetland has created an example for other parts of the UK to follow. I’m keen for the Islands Councils to play a full part in the on-going debate on how the substantial powers in the Scotland Bill are used to directly benefit island communities. Over the past few years there has been a process of centralisation from the Scottish Government but I hope through opportunities such as the devolution of management over the Crown Estate, this imbalance can be redressed. Days after he was met with protests at the opening of a food-bank in his Dumfries-shire constituency, Scottish Secretary David Mundell was in Stornoway today, where he pledged a commitment to handing more power to island communities. Mundell said the OIOF campaign – established earlier this year by the Comhairle, Orkney Council and Shetland Councils – was a model which other parts of the UK could learn from. During his visit to Lewis, Mr Mundell met with officials from the Comhairle, as well as calling in on local businesses including Harris Tweed Hebrides, in Shawbost, and Hebridean Seaweed. He was also given a guided tour of the new Museum and Archive centre at the restored Lews Castle. Meanwhile, Isles MP Angus MacNeil has claimed that by endorsing more power to island communities, Mundell has performed a ‘u-turn’. He said: “Hopefully Mr Mundell has become a belated convert to decentralisation. If he had listened when I put this forward at the last Scotland Bill in 2011 we would be a lot further forward. He opposed moves for decentralisation and resisted a push to devolve the Crown Estate to Scotland. His position on this issue has now changed due to the strength Scotland has with the SNP making Tory Westminster listen a little more. Kildonan on the Hebridean island of Eigg with the Sgurr of Eigg, the island’s highest point, visible in the background. 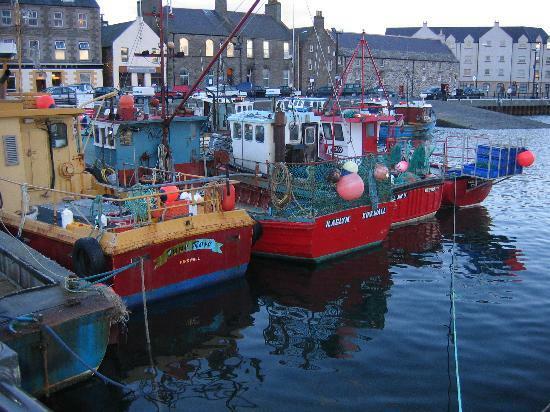 Mundell praised the global aspirations of Scotland’s island communities as he toured businesses across the Western Isles. His day included a visit to Hebridean Seaweed. Having established itself as the UK’s largest seaweed processor it is also one of the country’s export success stories having sold their produce across Europe, Asia and the United States. He said: “I’ve been extremely impressed by what I have seen today. Hebridean Seaweed’s announcement of a partnership with one of the most prestigious golf tournaments in the world shows how far they have come and highlights the global ambitions of companies from our island communities. He also visited the world renowned Harris Tweed Hebrides Mill in Shawbost and the Hebridean Smokehouse in Stornoway where he discussed trade, exports and the recent measures for businesses introduced in the Budget. He commented: “From Harris Tweed to Hebridean Seaweed I’ve valued the opportunity to visit a number of innovative and established companies in the Western Isles who are making their mark across the globe. Through the UK’s diplomatic and trade network in over 170 countries around the world, we want to encourage more companies to follow in their footsteps and get exporting. With this support the UK Government is right behind the aspirations of our island communities. 23 September 2015: Mundell to visit Shetlands – but will he find his way? Scotland’s Secretary of State David Mundell will visit the islands next Wednesday to meet representatives of Shetland Islands Council. Full details of his itinerary are yet to be released, but already some are wondering whether Mundell – who succeeded Northern Isles MP Alistair Carmichael as Scotland Office minister – will succeed in finding his way to Shetland. In response to the Scotland Office tweeting a photo flagging up how 6,900 new businesses were set up in Scotland with government support, political activist Miriam Brett suggested: “If you’d like to combat the criticism that you fail to understand the north, I’d start by adding Shetland to your map. 23 September 2015: Scottish Secretary David Mundell has called for a debate on what new powers Scottish local government should be given by Holyrood in order to take greater control over their own affairs. Mundell said that councils such as the Western Isles need to make their voice heard with the Scottish Government and make the case for greater powers. He said that Scottish towns and villages risked falling behind their counterparts in the rest of the UK. He also said that the Smith Commission Agreement was explicit that responsibility for managing the Crown Estate should be devolved to councils such as Orkney, Shetland and the Western Isles. Mundell said: “The issue of devolution to local communities is now an urgent one for Scotland. There is a revolution going on in local government across the rest of the United Kingdom, with local areas regaining power and responsibility at an unprecedented rate. Scotland cannot afford to be left behind as the rest of the UK revolutionises how it governs itself, giving towns, cities and counties more of the autonomy which our international competitors enjoy. It’s time we had a proper debate about devolution within Scotland. Councils like the Western Isles need to build on the OIOF initiative and make their voices heard with the Scottish Government on what powers and responsibilities they want to have to shape their futures. That should be national debate, and I commit to play my part in that. Devolution is not worthy of the name if it stops at the gates of Holyrood. The Smith Commission Agreement was explicit that responsibility for managing the Crown Estate, which is being devolved in the Scotland Bill, should be further devolved to local authority areas such as Orkney, Shetland, the Western Isles or other areas who seek such responsibilities. Shetland, Orkney and the Western Isles councils are seeking meetings with the new UK government to discuss the future of the (OIOF) campaign. Council leaders hope to meet Scottish secretary David Mundell, who replaced Northern Isles MP Alistair Carmichael, and other key players to seek reassurances on the commitments of the previous government on the campaign for more powers for Island areas. Although the previous agreements took place with the Conservative/Liberal Democrat coalition, the councils expect commitments to be honoured by the new Conservative government. Speaking for the three councils, Comhairle nan Eilean Siar leader Angus Campbell said: “We welcome the appointment of David Mundell as Secretary of State for Scotland, having worked productively with him in the past, and look forward to doing so in the future. We did the groundwork previously with the UK government and although there has been a change in government we would expect them to continue along similar lines with regard to Our Islands Our Future. It is good to hear the Prime Minister say that the Smith Commission recommendations, arising from the ‘vow’, will be honoured in full. From the islands point of view that is important as one of the key recommendations is the transfer of revenues and management of the Crown Estate to the Scottish government and, as agreed by Scottish government, onwards to local coastal communities, one of the key aims of the OIOF campaign.